I’ve found myself, more times than once, needing to change disk drives that my user databases are found on. This could come up because you are moving a server and need to switch SANs, migrate from local storage to SAN storage, or need to move to a new LUN because it was over expanded and your SAN techs can’t shrink it without a drop/create. 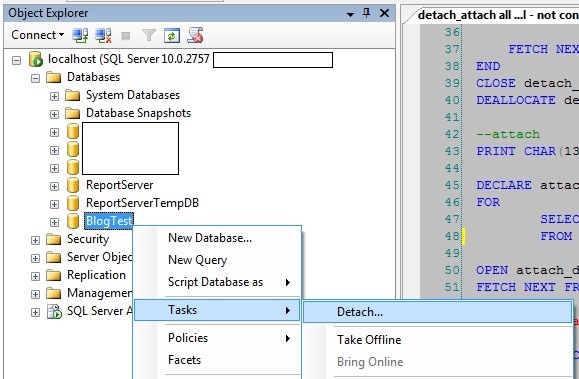 This exercise can be done with the GUI or with typed T-SQL but in my cases there are usually a couple of dozen databases with file in a number of different sub-directories. Today I’m going to go over each method but conclude on a T-SQL script that I wrote to do almost all of the work for us. 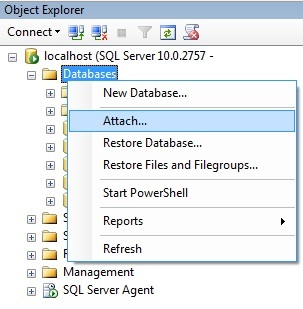 To detach a database and re-attach you will be using two different types of T-SQL. 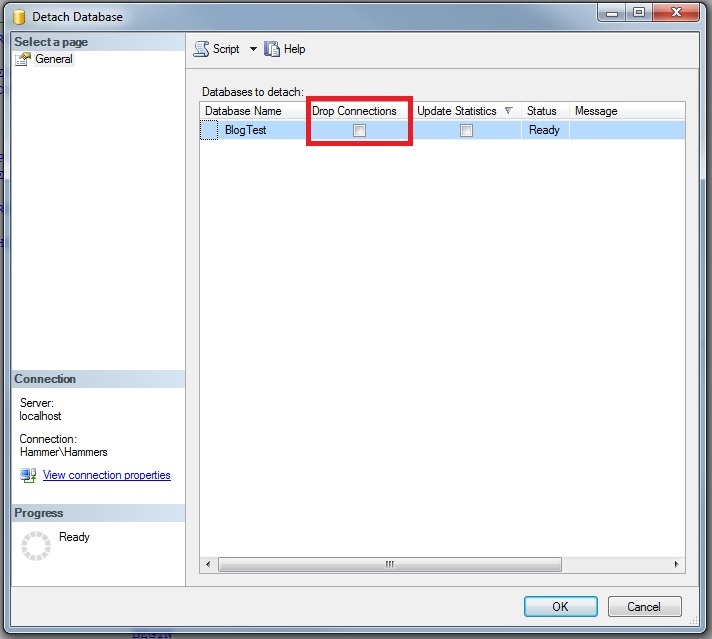 For the detach method you will be using the stored procedure sp_detach_db while for the attachment you will be using a CREATE DATABASE command with the FOR ATTACH option. 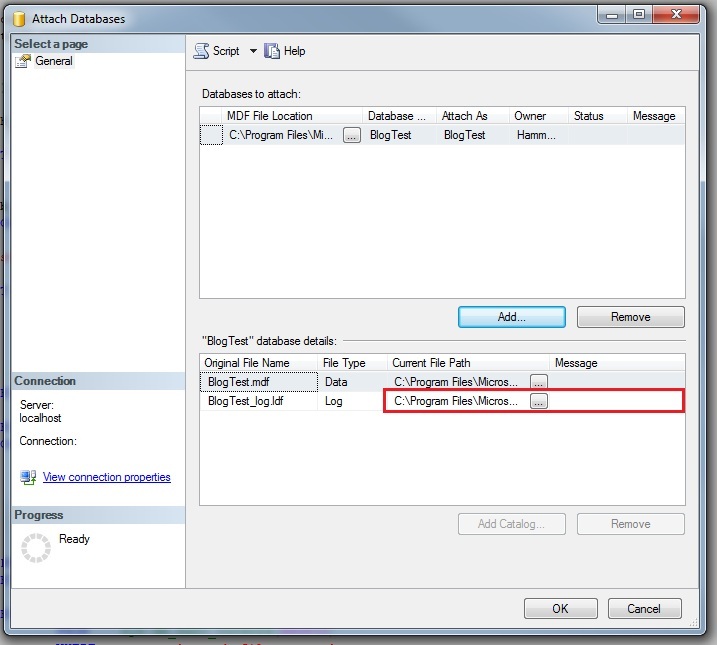 Right click the database that you wish to detach and select Tasks->detach. Check “Drop Connections” so that your detach won’t be prone to timing out due to a persisted connection. 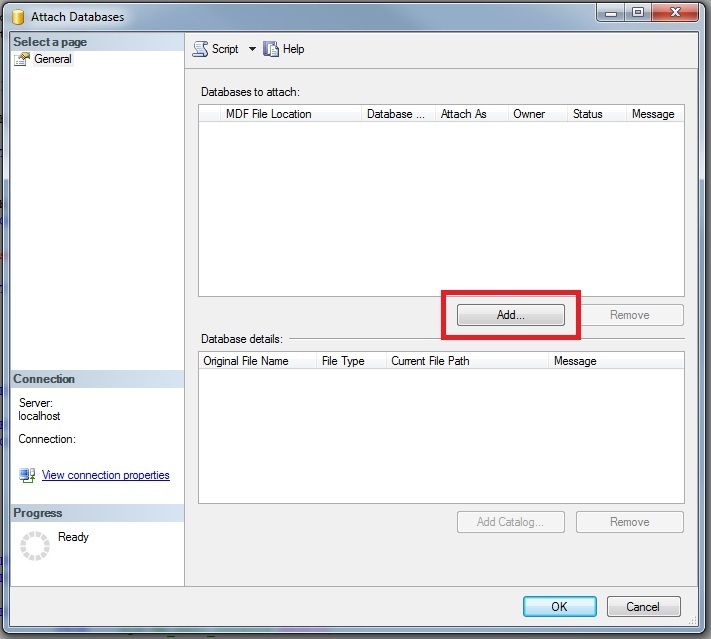 Locate and select the mdf file for your database and click OK. 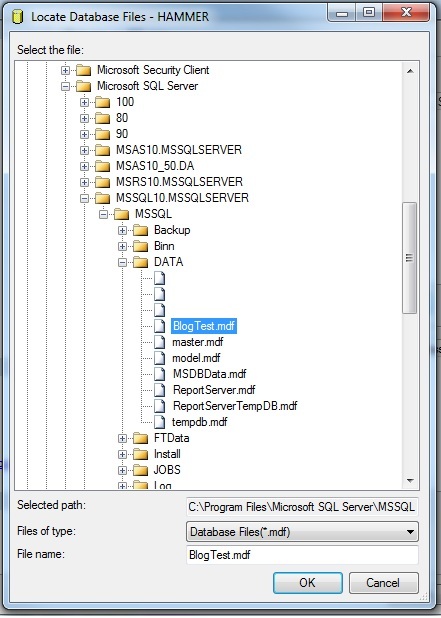 When your mdf file is selected the “database details” group box will be populated with a list of all of the files that are associated to the mdf. In my screenshot below the log file was discovered because it was in the same directory. If your ldf or ndf files are not in that same location there will be text in the “Message” field that will indicate that you need to tell it where the file is. You would, in this case, click the ellipsis that I have highlighted and navigate to the file in question. Click OK and your databases will be attached. Below is the script I wrote to write all of my detach and attach statements for me. It first prints out the detach statements but it queries for the database file locations and builds your attachment statements as well. Important: Once you run the detach scripts you will no longer be able to query the file information so don’t make the mistake of running these in the same query window as the print statements. I currently have this script setup to accept a data and log path in the variables @newdatapath and @newlogpath at the top of the script. This is for if you know the directories that you would like to move the databases to and if they are all the same for each database. I find this situation common but I have come across situations where I wanted to move drives but not change the folder structure. In that case I would build the folder structure and then replace the below lines of the script. 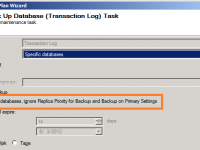 Using method #3 I was able to relocate the database files on 2 servers with 5 instances each and 1-2 dozen databases per instance in less than 10 minutes. Now I just need to move the system databases.